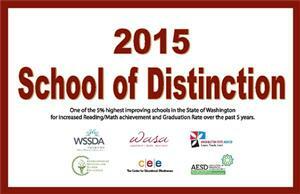 Our school district has again received a prestigious award in honor of grades 6 through 8. In order to win a School of Distinction award, our student achievement must have improved over a six year period of time (2010, 2011, 2012, 2013, 2014 and 2015) as it relates to spring MSP/SBAC scores within the content areas of Reading and Mathematics. Union Gap is one of 92 schools in the entire state to be selected for the 2015 award. Of that number, our school is one of 20 middle/junior high recipients (grades 6-8) of this year’s statewide Schools of Distinction award. Schools of Distinction honors are also being presented in the state to 51 elementary schools (grades 3-5), 21 high schools (grades 9-12) and 8 alternate schools. There are no awards presented for grades K – 2 since those grades are not part of the spring testing program. In a nutshell, Union Gap is one of the 5% highest improving schools in the state of Washington for increased Reading and Mathematics achievement over the past six years. In our opinion, we believe the award is really a Preschool through Grade 8 award since ALL of our staff have had a hand in the success of our older students! Our school district has again received a prestigious award in honor of grades 6 through 8. In order to win a School of Distinction award, our student achievement must have improved over a six year period of time (2009, 2010, 2011, 2012, 2013 and 2014) as it relates to spring MSP scores within the content areas of Reading and Mathematics. Union Gap is one of 101 schools in the entire state to be selected for the 2014 award. Of that number, our school is one of 22 middle/junior high recipients (grades 6-8) of this year’s statewide Schools of Distinction award. Schools of Distinction honors are also being presented in the state to 54 elementary schools (grades 3-5), 17 high schools (grades 9-12) and 8 alternate schools. There are no awards presented for grades K – 2 since those grades are not part of the spring testing program. In a nutshell, Union Gap is one of the 5% highest improving schools in the state of Washington for increased Reading and Mathematics achievement over the past six years. In our opinion, we believe the award is really a Preschool through Grade 8 award since ALL of our staff have had a hand in the success of our older students! Our school district has again received a prestigious award in honor of grades 6 through 8. In order to win a School of Distinction award, student achievement must improve over a five year period of time (2009, 2010, 2011, 2012 and 2013) as it relates to spring MSP scores within the content areas of Reading and Mathematics. Union Gap was one of 99 schools in the entire state to be selected for the 2013 award. Of that number, our school was one of 21 middle/junior high recipients (grades 6-8) of this year’s statewide Schools of Distinction award. Schools of Distinction honors are also being presented in the state to 54 elementary schools (grades 3-5) and 21 high schools (grades 9-12). There are no awards presented for grades K – 2 since those grades are not part of the spring testing program. In a nutshell, Union Gap is one of the 5% highest improving schools in the state of Washington for increased Reading and Mathematics achievement over the past five years. In our opinion, we believe the award is really a Preschool through Grade 8 award since ALL of our staff have had a hand in the success of our older students! Our school district received a prestigious award in honor of grades 6 through 8. In order to win a School of Distinction award, student achievement had improved over a five year period of time (2008, 2009, 2010, 2011 and 2012) as it relates to spring MSP scores within the content areas of Reading and Mathematics. Union Gap was one of 97 schools in the entire state to be selected for the 2012 award. Of that number, our school was one of 24 middle/junior high recipients (grades 6-8) of 2012's statewide Schools of Distinction award. Schools of Distinction honors were also presented in the state to 54 elementary schools (grades 3-5) and 19 high schools (grades 9-12). There were no awards presented for grades K – 2 since those grades are not part of the spring testing program. In a nutshell, Union Gap was one of the 5% highest improving schools in the state of Washington for increased Reading and Mathematics achievement over the past five years. In our opinion, we believe the award was really a Preschool through Grade 8 award since ALL of our staff have had a hand in the success of our older students!